A Little Sunday Zentangle …. 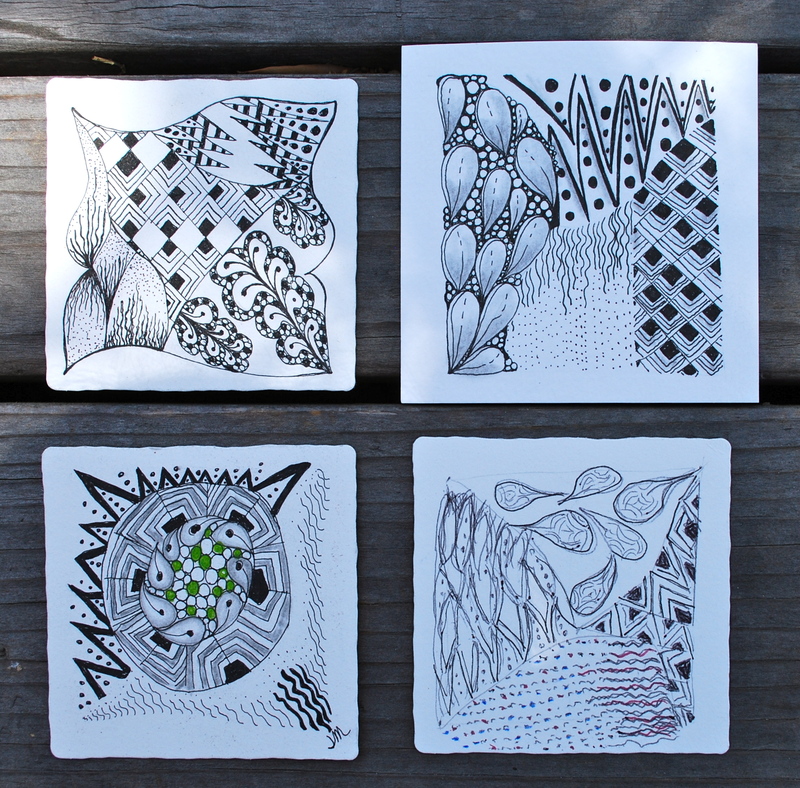 Once a month, four or five of us get together and spend a couple hours focusing on Zentangle. We rotate the hosting duties, which really only includes having a space for us to gather and maybe a simple snack and/or beverage. Sometimes a project has been planned in advance by the hostess; other times, we decide at meeting time. A few of us are die-hard Zentangle enthusiasts, while the others partake this one time a month. It’s turned out to be a fun group and something we all look forward to. Today, I hosted the gathering of four. I got out my “blue box” (Zentangle® kit) and decided that we would each roll the icosahedron one time, giving us four patterns to work with. We drew our own strings, dividing our tiles into four spaces. We then proceeded to use the four patterns and fill in our own tiles. It’s so fun to see how they all turn out … so different and yet we all used the same patterns. Here’s a picture of our finished work.